How to survive California's hottest surf spot: Never go anywhere without a bathing suit. Never cut your hair. Never let them see you panic. The year is 1972. Fifteen-year-old Haunani "Nani" Grace Nuuhiwa is transplanted from her home in Hawaii to Santa Monica, California after her father's fatal heart attack. Now the proverbial fish-out-of-water, Nani struggles to adjust to her new life with her alcoholic white (haole) mother and the lineup of mean girls who rule State Beach. Following "The Rules", an unspoken list of dos and don'ts, Nani makes contact with Rox, the leader of the lineup. Through a harrowing series of initiations, Nani not only gets accepted into the lineup, she gains the attention of surf god, Nigel McBride. But maintaining stardom is harder than achieving it. Nani is keeping several secrets that, if revealed, could ruin everything she's worked so hard to achieve. Secret #1: She's stolen her dad's ashes and hidden them from her mom. Secret #2: In order to get in with Rox and her crew, she spied on them and now knows far more than they could ever let her get away with. And most deadly of all, Secret #3: She likes girls, and may very well be in love with Rox. "Where was this book when I was fifteen? Honey Girl is a daring debut. A fierce story of female friendship, earned acceptance, and following the unwritten rules of Southern California beach boy and girl culture in the'70s." "Teens will marvel at this retro journey into vintage beach culture...[and] ache with Nani's pain and the challenge of being 15 and trying to find one's way." 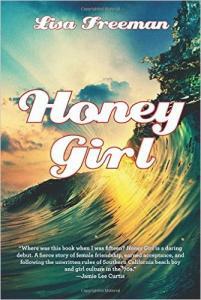 "This funny yet gripping page-turner, the first novel by the daughter of Hawaii Five-O creator Leonard Freeman, captivates the reader through Nani's honest, confessional, sassy, and utterly engaging voice…Packed with action, attitude, and empathy, Honey Girl should become a YA classic." "Lisa Freeman's debut YA novel is one of those delicious books you want to drink down in one sitting…she creates a world rich with detail and description, dropping you into the complicated social structure of elite surfers and the girls who want them…"
"…Very Mean Girls. It conveys the nerves and delicate balance of trying to find your place in a new friendship group, all in a very refreshing and unique way." "Historical fiction in YA often means gowns, or at the very least flapper dresses, but Freeman's surfer chick novel travels them back to the early '70s, just long enough to detach her characters from texts and e-mails but still have them bombarded with familiar bits of pop culture." "In this emotionally-compelling, relatable new novel, Nani fights to earn her place in the group, but also to understand and come to terms with who she is." "A time machine that zipped me straight back into Southern California in 1972!…Lisa Freeman tells an authentic, funny, poignant, and touching story with a delicate but subversive feminist touch. Paddle out and hang ten with this gnarly read!" "If Jane Austen had been a fifteen-year-old Southern California beach girl living in the 1970s, this is very possibly the novel she would have written. Lisa Freeman catches it all: the baby oil for tanning, the abalone bracelets, the taste of salt on skin. Honey Girl is a bildungsroman and book of etiquette rolled into one, and its subject is one of my favorite cultures: the brother (and sister) hood of surfing." "Moonlight meets Gidget in this '70s-set YA tale..."